Just moved into my first house! Here is my lounge/family room. A couple of questions I'd like opinions on, keeping in mind that I am a minimalist and I like modern/contempary looks but without them being industrial/cold. Also the window is going to be replaced and the new window is a black frame. The coffee table came with the couch, I will be replacing it as it looks too big for the room and makes it too much black. Any opinions on what would look good for a coffee table would be appreciated. I'm thinking a wooden circular one. 1. Which option for the TV - wall mount TV and a soundbar on the wall with no TV unit at all, or slim straight line TV unit, or get a corner unit (would hang in front of window), or get a custom corner unit made that has one longer side and one shorter side so it fits in. Would a wall mount or straight line unit look odd given that I have a corner couch positioned where it is? Sort of like it's only facing 1/2 of the people on the couch. 2. Lamps/artwork/accessories/fake plants - something to make it not look so bland and dull! How I should add a bit of colour to brighten it up. 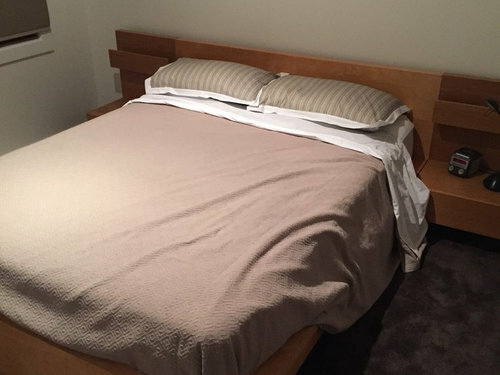 Same question with the bedroom - looks very dull and bland - how can I liven it up a bit? 1. Given the tight-ish space, you're probably best off wall mounting the TV, and choosing a smaller but still rectangular clear glass topped coffee table as that will appear to take up no space at all. If you wall mount the tv on a movable bracket you can angle it when you have ppl over so everyone can see better. With the small space you have I would personally do away with the coffee table & rug all together to make the space feel more open. 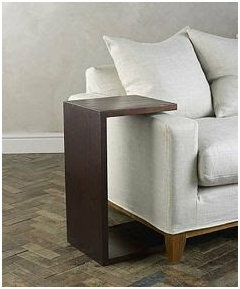 You could get one of those side tables instead that come up & over the side of the lounge. Corner units are a bit old fashioned so I'd just go for a nice straight lowline & you can decorate that (small pot plant/ vase etc). Use a throw to cozy up the space & if you like curtains hang some from ceiling to floor the whole length of the wall where the window is to make it look bigger. I think the space will come up lovely! If you definitely want a coffee table I think either a round wooden one would work, or a glass one as previously suggested. 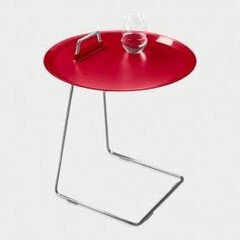 This is what I meant by over the arm side tables. Unusual shape of room....less furniture is a tip. Corner cabinet affair for your tv or up on the biggest wall. Ditch coffee table, lounge to face window with a couple of single comfy chairs and maybe some wall art. Done! ( paint room white). There is not enough height in the bed head so it looks a bit funny. You could add this IKEA design it's a similar colour to your bed and invest in good quality bed linen and a bed cover.you can get bed covers at IKEA as well but not bed linen not the best quality. Help! 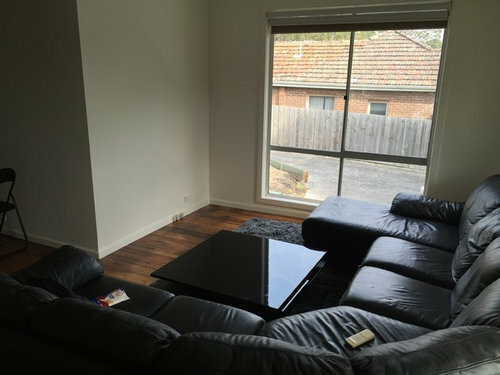 Need ideas for our tiny lounge room!